Torr05 - The starting point for this research is an exploration of the beginning of socialist and communist thought. These writings cover a range of topics varying from the flaws considered to form part of democratic capitalism that, it is believed, can only be expunged through a socialist dictatorship and the percieved flaws with representation that can only be eradicated through an anarchistic rise of socialism. These notes neither favour one of these solutions or the other and this indicates that both are intended to be explored in the book for which these notes were to form the basis. CP/IND/TORR/03/01 - The book was eventually published as 'The British State' (Lawrence & Wishart, 1958) by James Harvey and Katherine Hood (pseudonyms of Roger Simon and Noreen Branson). These drafts, notes and synopses combine to reveal a book that focusses on making the case for replacing Democratic Capitalism with a Proletariat Dictatorship. The different stages of the book's development revealed here illustrate both changes in structure and the new formations of ideas that are created by such changes in structure. Documents and notes for projected book on 'The State'. CP/IND/TORR/03/02 - This research concentrates on symbols of state power, state force and workers fighting the state. The correspondence which forms the majority of this grouping covers a variety of issues ranging from the church to expanding Marxist education and the constitutional history of England. 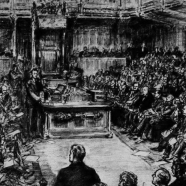 A core theme running through transcripts and printed content is the role of parliament and the representatives within it. These items also feature a notebook with Torr's notes on 'the state' before concluding with a report on Tom mann's role in industrial action at Liverpool. Notes on Anarchism (especially on Kropotkin) for projected book on 'The State'. CP/IND/TORR/03/03 - These notes focus upon Kropotkin's interest in a possible use of Anarchism to achieve Socialism. Notes from Kropotkin argue that the idea of any type of representation is flawed and indicate that Anarchism may be a more effective solution. These notes also include other authors' works on anarchism, including Henry Seymour's call for people to cast aside the wedding ring and such conventional moral symbols.